Frosty wore a few other hats before coming to life with the magical top hat. 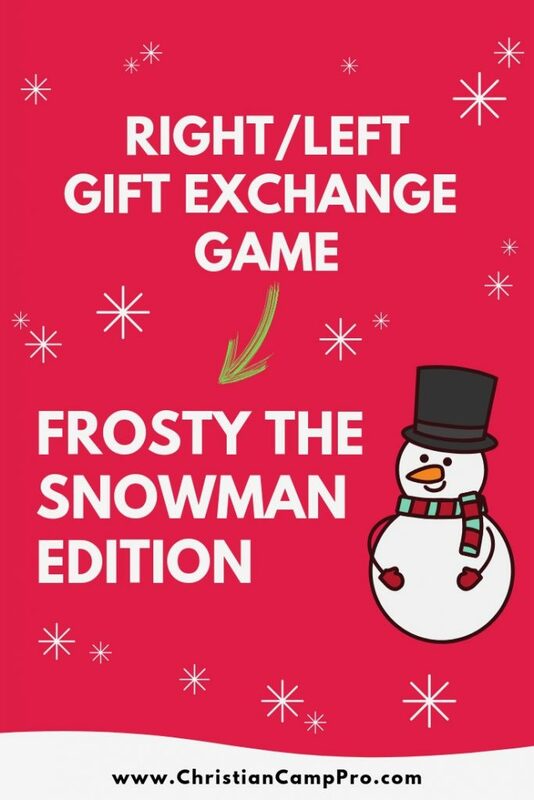 Use the story of Frosty to pass out door prizes, Secret Santa, or gag gifts to your guests. Give each guest a gift and have them sit in a circle as you read the following story aloud. When the word RIGHT is read, guests should pass their gifts to the person on their right. When you read the word LEFT, they should pass to the person on their left. The gift they are holding at the end of the story is the one they open and keep! A few days RIGHT before Christmas the town’s children decided to build a snowman RIGHT in the center of the park. The snowfall the evening before had LEFT a clean blanket of snow on the ground, perfect for building a snowman. The children gathered round and rolled the snow up and down and LEFT and RIGHT. The snowballs grew as they rolled them and soon they were big enough to build a wonderful snowman RIGHT in the middle of the park. The children found some pieces of coal and stuck them RIGHT into the snowman’s head for eyes. One of the girls brought a small red button that was LEFT in her mother’s sewing box to serve as a nose. A corn cob pipe was placed RIGHT where the snowman’s mouth would be. The children stepped back and examined what they had made. The snowman looked wonderful, but something was missing. What was LEFT to add? A hat! Hurrying home, each child found a hat and then hurried RIGHT back to the park. They all took turns placing the hats on the snowman’s head to see which one looked RIGHT. The first hat was a flowered hat that had been LEFT in the attic of one of the girls. She placed it on the head of the snowman and stepped back. The flowers were faded and the hat was too droopy and the children all agreed that it just did not look RIGHT at all. The next hat was a smart brown fedora LEFT over from a Halloween costume. This hat looked better than the flowered hat, but it still wasn’t quite RIGHT. The children tried several more hats: a knitted cap, a French beret, a straw sun hat and even a cowboy hat. None of the hats were RIGHT. RIGHT as they were about to give up on hats for the snowman, a child arrived carrying a black silk top hat. “Where did you find that?” asked his friends. “Someone LEFT it sitting RIGHT on top of the garbage bin!” the boy exclaimed. His friends watched in anticipation as the boy stepped RIGHT up to the snowman and placed the silk hat on top of its head. As the hat settled RIGHT onto the snowman’s icy brow, a flurry of snow blew up and swirled around the group of children. They gazed at the snowman and their eyes grew wide as it quivered and came to life. The snowman raised his LEFT arm and then his RIGHT. He blinked his RIGHT eye, then his LEFT. He smiled and spun in a circle, which LEFT the children shocked and amazed. “Merry Christmas!” the snowman shouted to the children gathered around him. The children looked at each other and grinned. “There must have been some magic LEFT in that old silk hat,” said the boy who had brought the hat. His friends agreed and then they all ran RIGHT off to the center of town to play with their frosty new friend.